When it comes to Texas Hold’em, there are various strategies one can employ both before and after the flop to surprise your opponents and catch them off guard. Even though the game has changed and evolved over the years, check raising someone still remains a very powerful play that many players just aren’t prepared for or don’t see it coming. In this article, we’ll cover the fundamental check raising strategy and bring you some useful tips to better implement this powerful weapon into your game repertoire. While you may feel reserved about some of these tips at first, once you see them in action and realize they work quite frequently. You’ll soon come to understand why check raising is often the right move. Every now and then, you’ll defend your big blind and end up flopping a really big hand that you know is the winner and is likely to stay the winner going to the showdown. In these situations, you want to implement check raise simply to extract more value. If you flop a straight with your small suited connectors, you want to check it over to the initial raiser and let them fire a continuation bet so you can raise them. Of course, you do need to balance this with an occasional call when you have a huge hand, otherwise your opponents might figure out you’re only raising them when you have the nuts and an observant player might even fold a big hand in relative terms (such as an over-pair to the board) if they know you’re always doing it with the nuts. While you should probably never check raise on a pure bluff, there are spots where you can do it with a hand that has a bit of potential to improve but you’re essentially hoping your opponent will give up and let you win the pot. For example, in a situation where you flop a gutshot draw, you might throw in an occasional check raise. Even if you don’t hit your card on the turn, you might pick up additional outs, giving you the reason to fire a second barrel, which will often be enough to get your opponent to fold. In these scenarios, you should always keep an eye out for the information provided by your poker tools and software. If the player in question has a very high c-bet frequency, they’re more likely to give up, as their hand is usually weak. 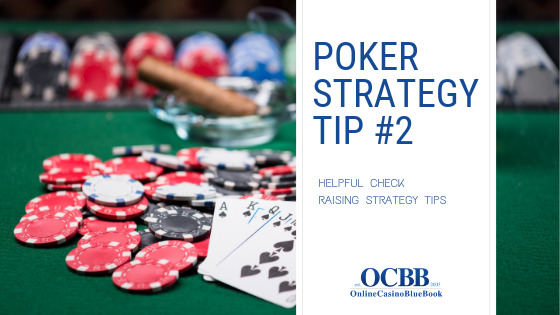 Players with a lower c-bet frequency usually continue only when they connect with the board in some way, shape, or form and your check raise is less likely to work against them. A third scenario where check raising can be a very powerful weapon is when you actually flop a big draw but don’t have a made hand. In this situation, you’re essentially betting as a bluff. But, you’re also building value for those times when you do hit. For example, a straight and a flush draw combo is a very strong hand to check raise with even though it has no showdown value at the moment. This kind of hand will let you put a ton of pressure on your opponent by check raising them on the flop and proceeding to bet big on the turn. Even if they decide to stick around and refuse to fold, you’ll still have many outs going to the river and with the pot being so big, they might find it hard to fold when you do hit your gin card. So, by playing your big draws aggressively, you’ll give yourself more ways to win the pot. Of course, you should always balance things out, so that sometimes you do play big draws passively and your huge hands fast and vice-versa, so that your opponents never really know what’s up until the showdown. Always keep them guessing and they’ll be more likely to make the wrong play against you, whether it is calling you down with a losing hand or throwing away a winner.